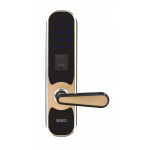 A safe and convenient life made accessible by Senzo Smart Door Lock. Suitable for : Homestay, hotel, home, office, server room, and store. A safe and convenient life made accessible by Senzo Smart Door Lock. It accommodates each person's i..